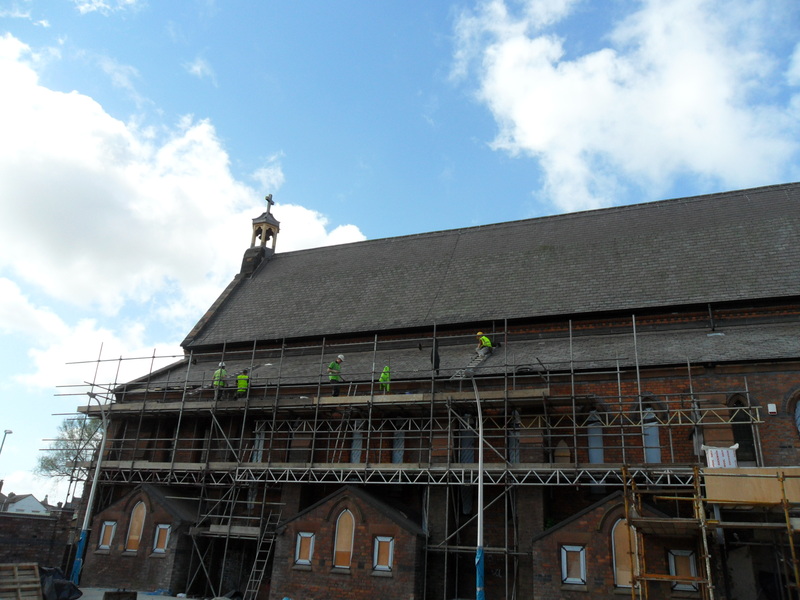 Time for some more photos from Halton & St Helens VCA’s continued redevelopment of St Marie’s. The pictures were taken by the brilliant Dave Clark from John Turner Construction Ltd. Thanks Dave! 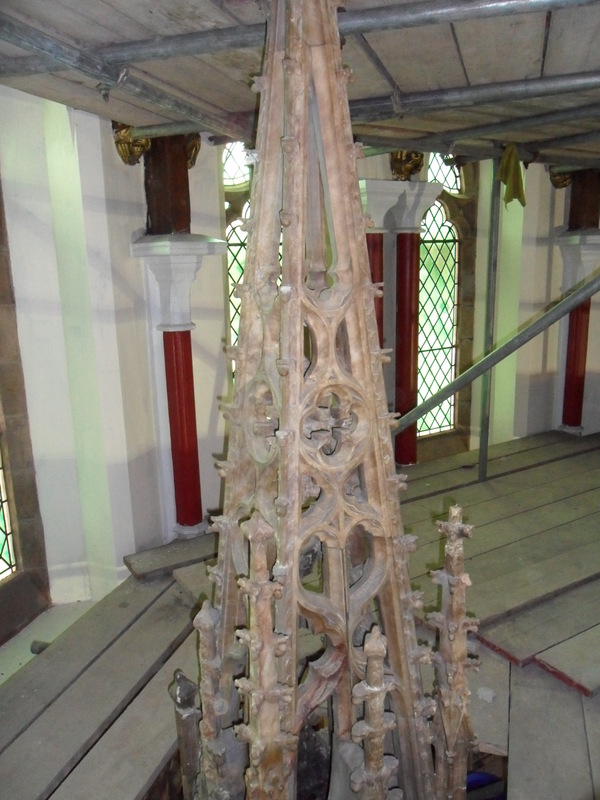 Removal of scaffolding following high level repairs and decoration. Plaster repairs following dry rot treatment. The new zinc rain water diverter installed below foot of down pipe. 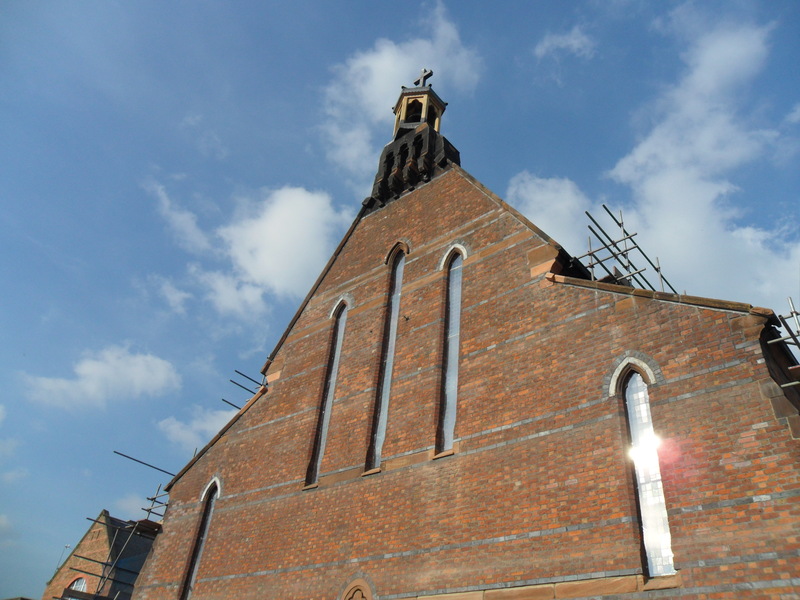 A quick snapshot of the ongoing redevelopment of St Marie’s in Widnes. 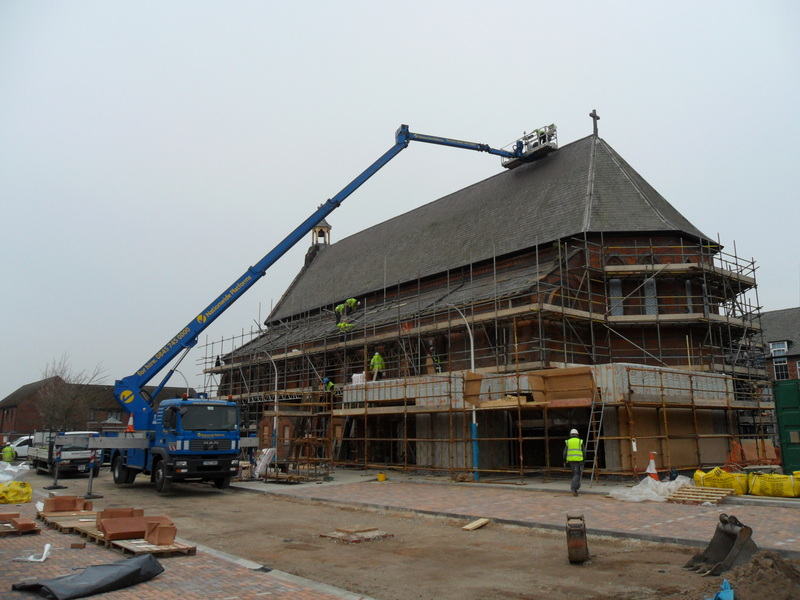 The photos (as always) were taken by Site Manager, Dave Clark (John Turner Construction Ltd). 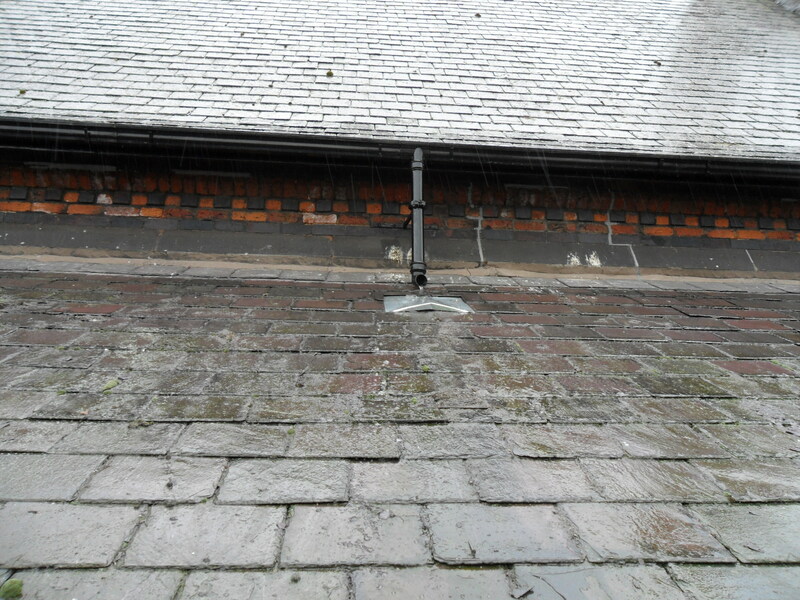 Completing slate repairs to mid roof level. 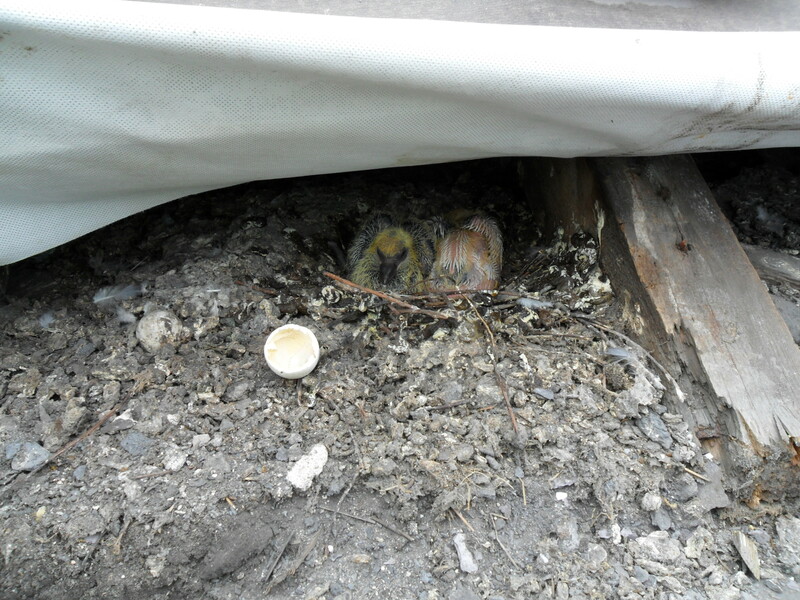 Pigeon chicks found hatched within the roof eves. They were safely removed. Another shot of the new roof. 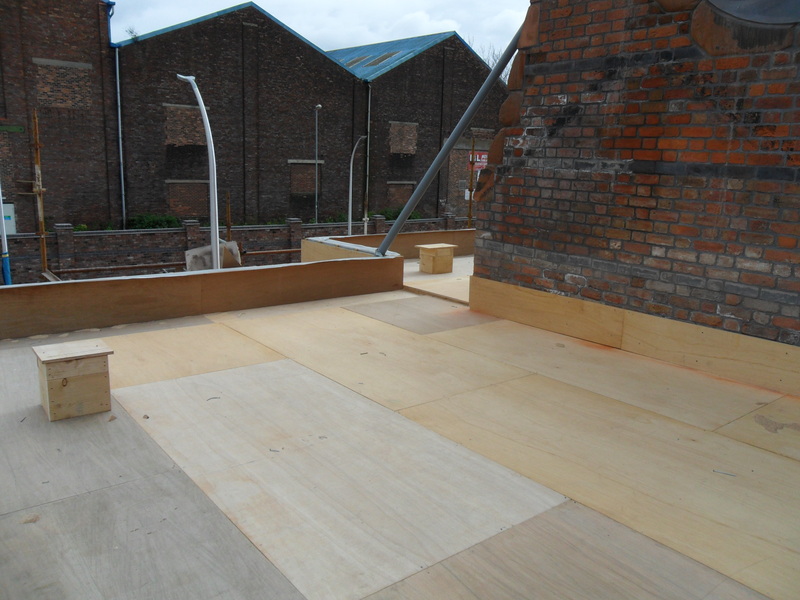 Plywood boarding laid awaiting kingspan insulation and a single ply membrane to complete the installation. 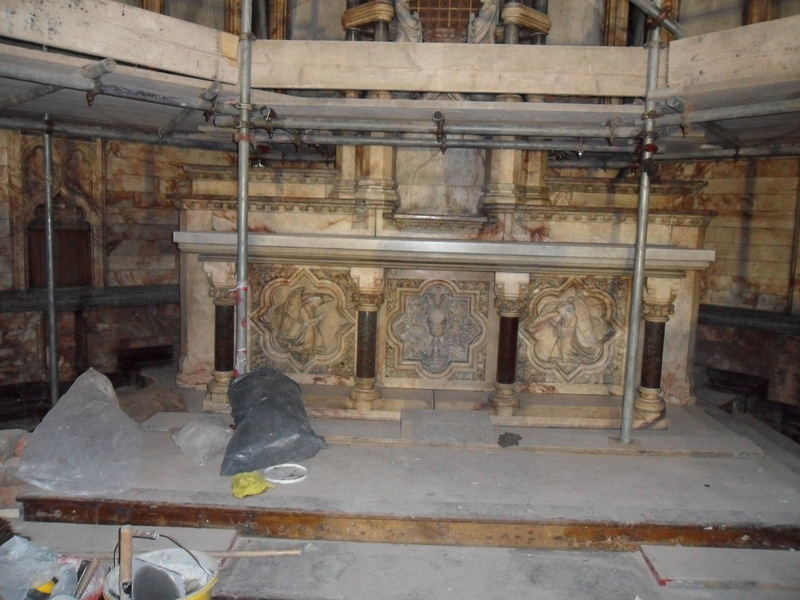 Marble on the alter following a further clean from Tom. Hello again. Time for our favourite photographs taken on site this week. Our thanks to Dave Clark from John Turner Construction Ltd for taking the pictures. 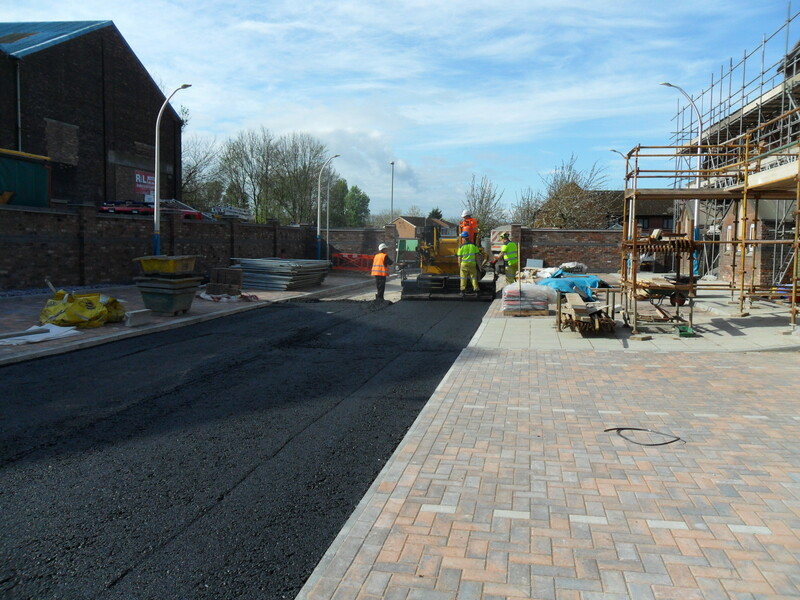 Laying the base coat tarmacadam for the new car park. 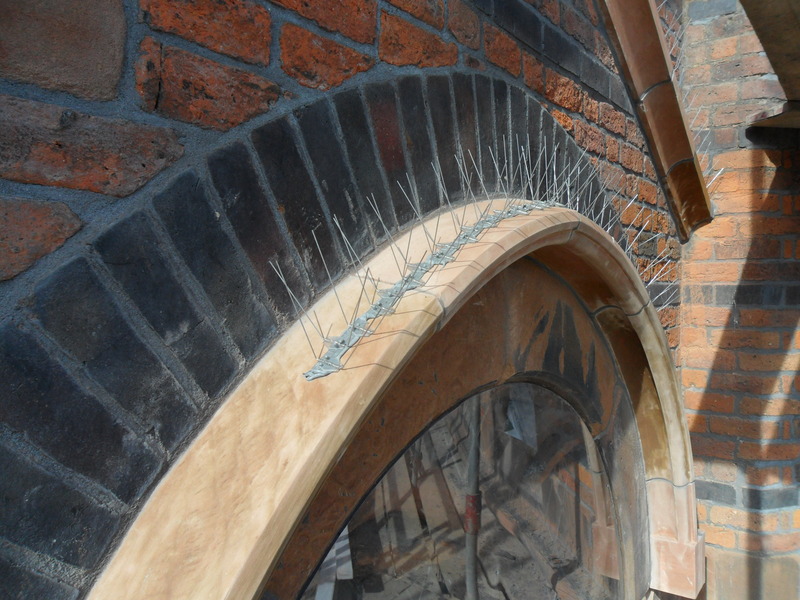 New bird deterrent on top of the head of the circular window. 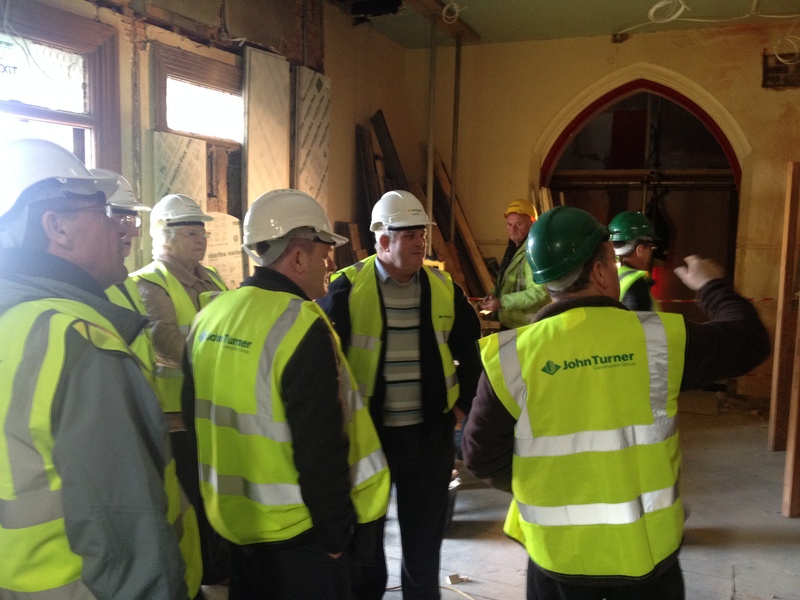 On Wednesday 26th March, local residents had the chance to visit St Marie’s and see John Turner Construction Ltd’s handiwork in a special Joinery Workshop. 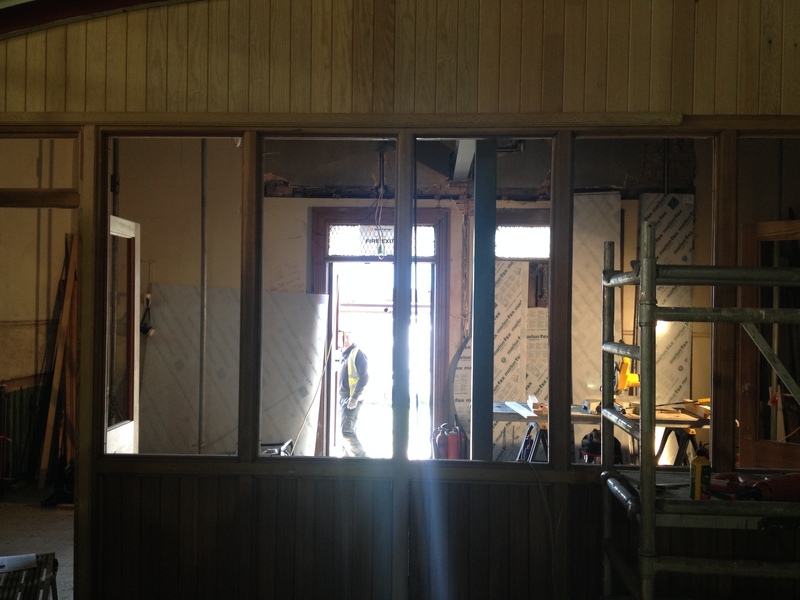 The workshop was lead by Richard Aylesbury, the Joinery Workshop Manager for John Turner Construction Ltd.
Richard explained how his team had used the damaged C shaped screen (from just inside the old entrance) and restored the wood and glass to make a screen wall. 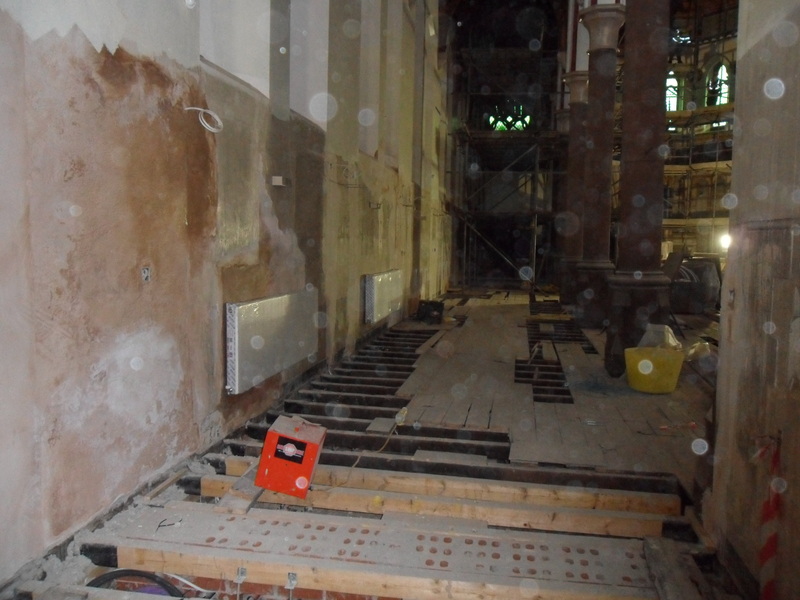 The wall (which is made up of wood from the original screen along with wood from some of the St Marie’s pews) will be positioned below the organ loft, just a few feet away from where it originally stood. I hope you’ll agree with me when I say that I think the guys have done a terrific job. The Joinery Workshop was well received by those in attendance. Everyone who attended expressed an increased interest in the topic of Joinery. 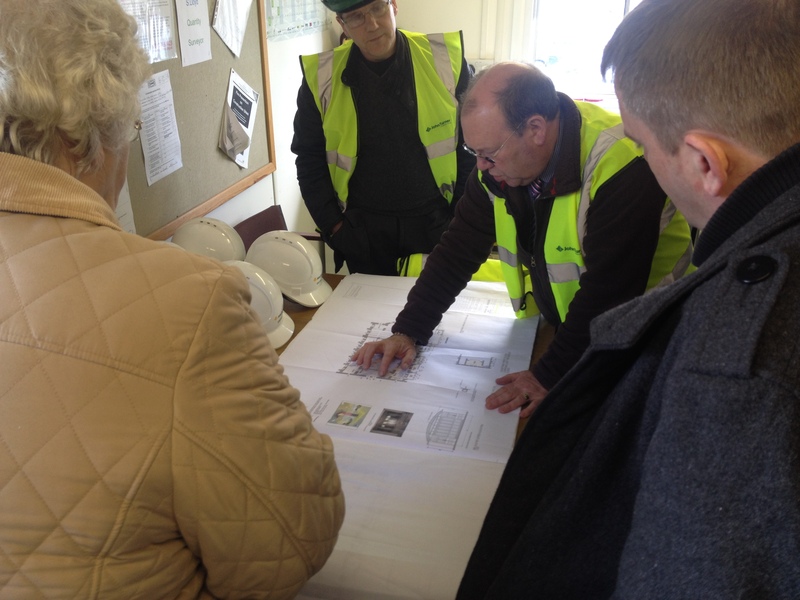 Dave Clark (Site Manager and Official Website Photographer) explains the plans to the group. Richard looks on. The team enter St Marie’s. From Left to right: Paul, Keith, Teresa, Chris and Paddy. 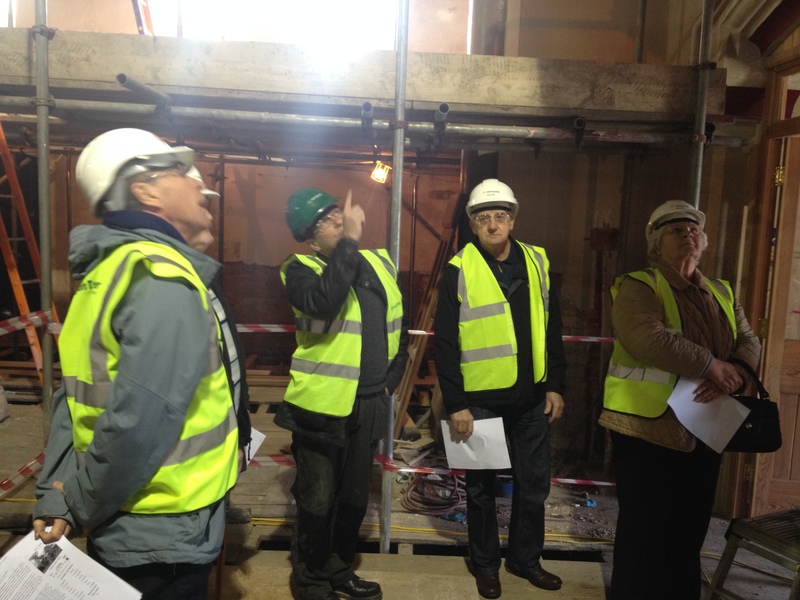 Richard talks to the group about the organ loft. 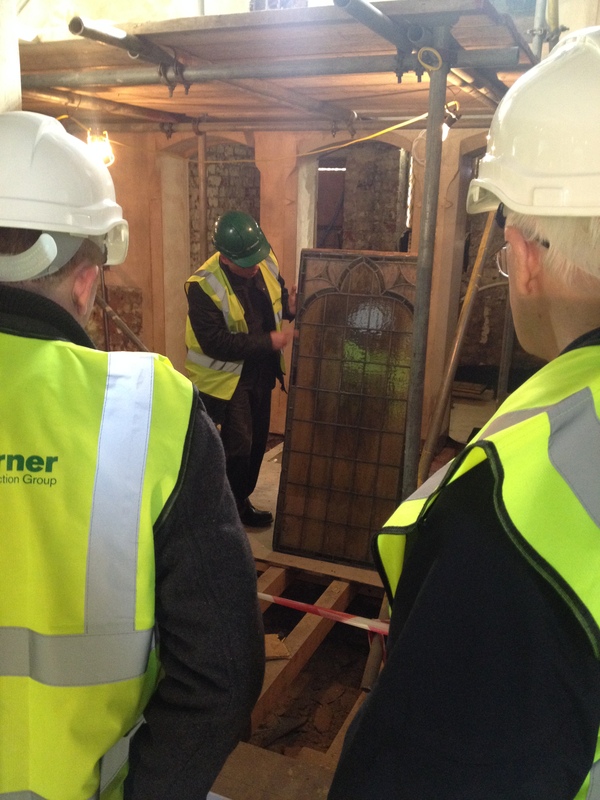 Richard shows the restored stained glass panels to the group. They will make up part of the screen. 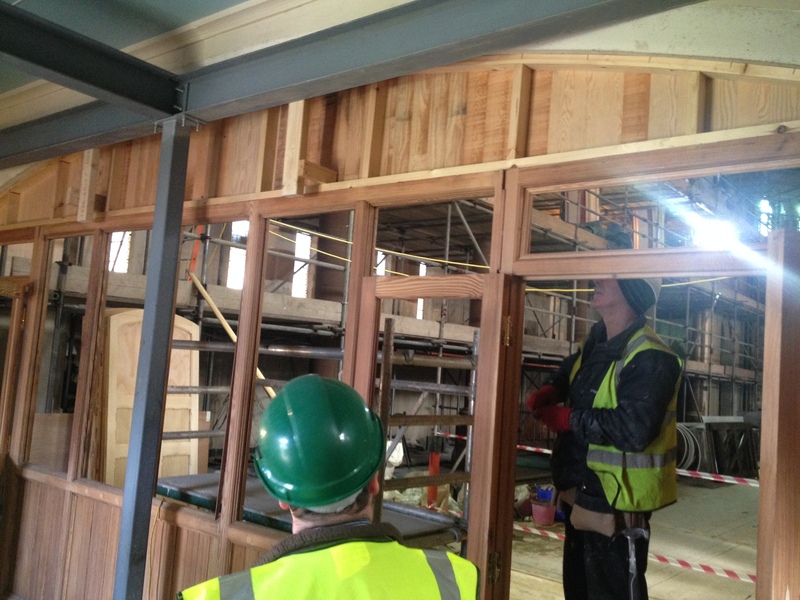 The guys from John Turner Construction Ltd at work on the screen. A view of the screen from the other side. A slightly different view of the screen from the other side. 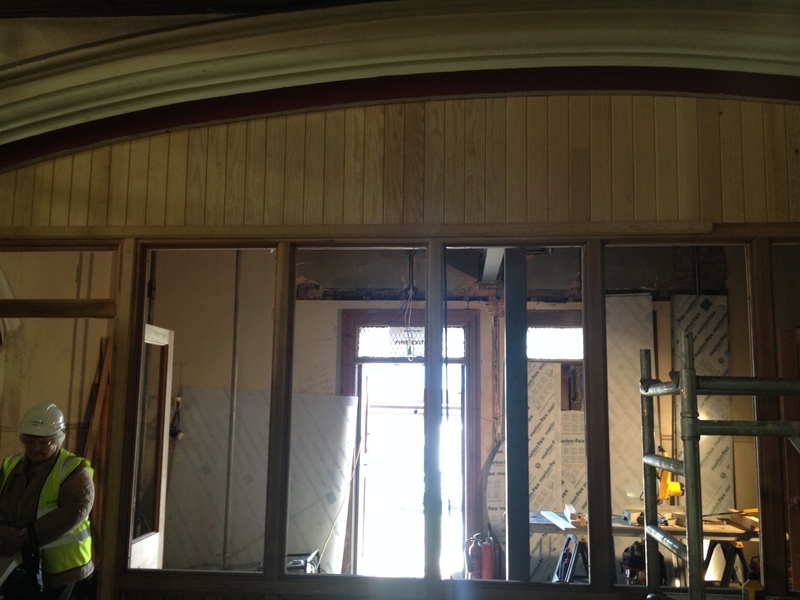 A cheeky photo (taken a few weeks after the workshop) which shows the progress we’ve made on the screen. 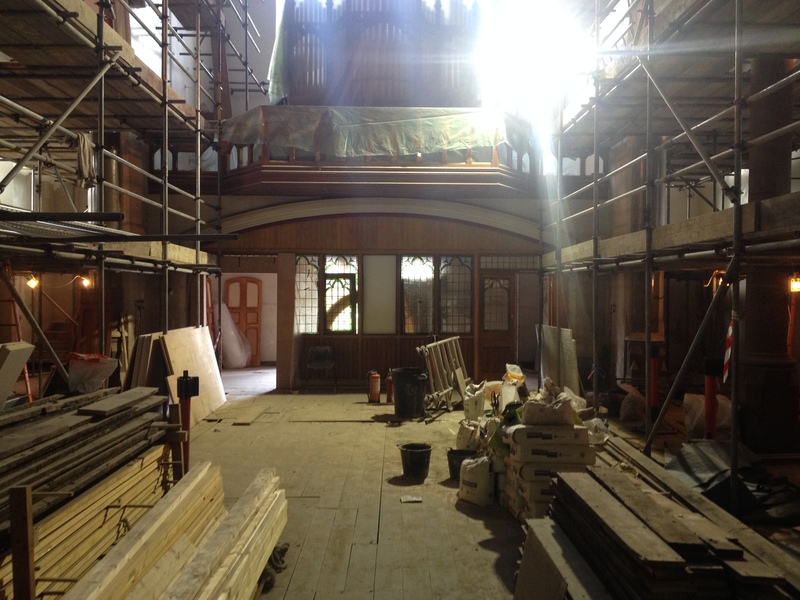 Time for another snapshot of Halton & St Helens VCA’s Redevelopment of St Marie’s Church. These photos were taken by Dave Clark from John Turner Construction Ltd.
As always, we’re extremely grateful to Dave for his time and efforts! 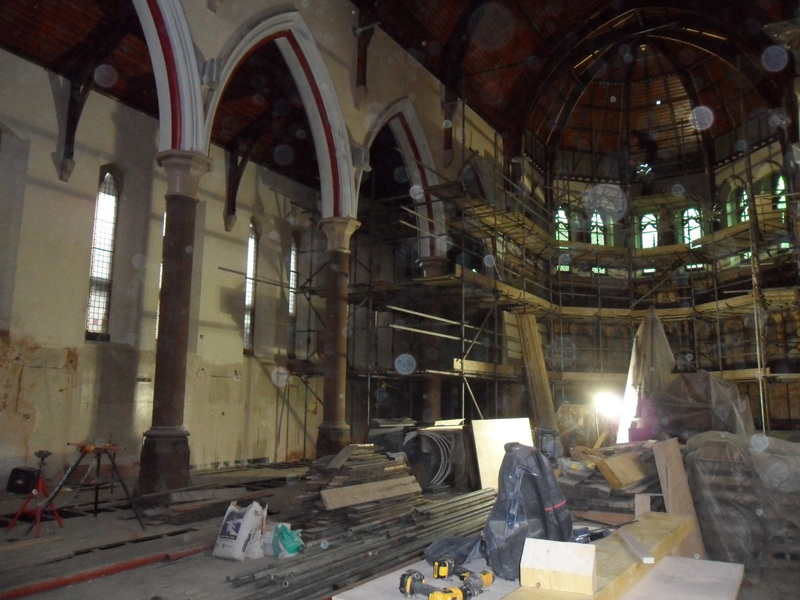 The scaffolding has come down on the Organ/Bell Tower end of the Church. 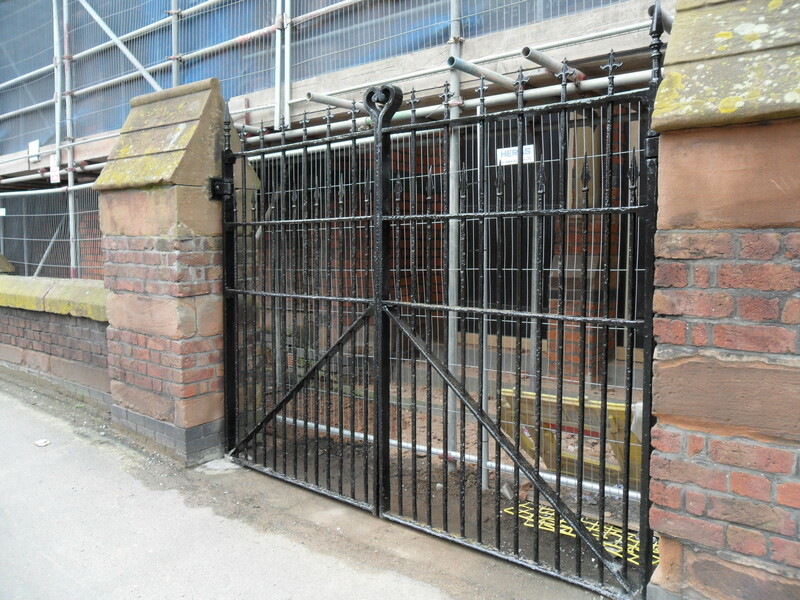 The gates have been restored (shot blasted and various metal repairs, then repainted). They will be permanently shut. The entrance into the building will be via the car park on the other side.